Nothing of great significance has been happening at Possum Valley, so if you are looking for drama, change channel. Certainly nothing much in the way of rain. Hot and dry for the last 4 months and I’ve just looked at BOM forecasts and that is likely to continue into January. The creek is down to a trickle, so the hydro power now less than half full power and soon to go into emergency mode where I can’t keep the generated volts up to 240V and it slides down to 180V where I decide I can’t punish the equipment any more and have it survive, and shut the system down. But honoured guests will not notice the difference as that is the generating side, on the delivery side all will be normal as I rely on the solar panels and patch in a standby generator as required. I will glide about like the proverbial duck, all serene on the surface, paddling furiously under the water (or lack of). I shouldn’t complain as I had my average annual rainfall already in the first half of the year. But I will complain anyway, as it may be with climate change this sort of nonsense becomes an annual event. The tropics is predicted to retain its rainfall according to the models, but in more extreme events and perhaps wetter wets and drier drys is part of that. Yes Martin, I know this is also a El Nino year, but allow me to postulate ripples on trends. But hey! it’s great for getting the washing dry. Can’t remember the last time I used the dryer. Had some guests from Europe recently and they were well pleased with the show the wildlife put on. 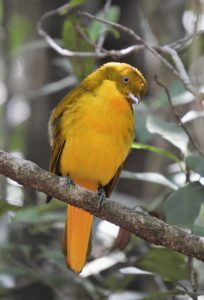 Some Belgians came wanting to see satin bower birds and bowers, but I couldn’t find any so I said will golden bower birds do? The bower was close, the bird turned up to do house decorating and the Belgians were blissed out. They didn’t imagine they would see this rare bird. One of them took this picture. A couple of biologists from Switzerland were here for 5 days and invested their time to see tree roos, platypus, golden bower birds, snakes and much more. Their daughter got to feed and stroke possums. I’ve been to Switzerland. It’s mostly rocks covered with ice, but with a couple of big lakes and limited lowland crammed with people and farms of 5 hectares and so neat and manicured like you wouldn’t believe. They said biology conservation in Switzerland was looking at plots of half a hectare containing some interesting snails. Update! The creek has gone down and the hydro now in emergency mode with the entire creek going through a 22 mm nozzle that I can’t get my thumb through. My source of entertainment in recent weeks has been politics, with the ever popular farce of the Trump Show, the long running soapie called “Brexit” and our very own tragedy drama series by the name of “Canberra”. I like to think our homegrown comedy was the best since Clueseau, Inspector Gadget and the ‘Carry On’ films for its hilarious and idiotic bungling. Our politicians, having given up any pretense of running the country, resort to outlandish plots to win a few votes. Scomo’s feeble ploy of floating the idea of moving the Australian embassy to Jerusalem, was so inept and transparent that even the Jews in Wentworth were hooting with derision and insulted that he thought them stupid enough to take the bait of mirage pork barreling. And so, our erstwhile PM fades into the sunset as slain PMs do, leaving only the evil ghost of the mad monk to haunt the corridors of parliament house chortling and grinning over his latest victim and scheming anew to wreak havoc on anyone who dares to mention climate change. 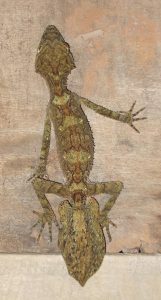 The only thing the Swiss biologists didn’t find that they wanted to see was a leaf-tailed lizard (gecko?). Ulrich, my new Swiss friend, is a herpetologist which means someone who studies creatures with scales. That name annoys frog experts no end, as they are also included as herpetologists but frogs don’t have scales. The leaf-tailed lizard is a beautiful animal with amazing camouflage on a lichen covered trunk. I have an excellent picture from of one in the wild (thanks Mandy), but it’s like a ‘where’s Wally’ puzzle, it took me ages to find it, so I post a pic I took in my workshop where this one was behind the door and shows up much better on the plain boards. Ulrich, if you ever happen to look at my blog, this is what you missed. The Swiss biologists are still living on the energy of the Possum Valley experiences. Love reading uour rambles..highlight of my week! We could all do with some rain..my creeks down to a sludgy mess and wildlife feature near creeks at moment is paperwasps..painful luttle buggers. Though with the rain some might say be careful what we wish for ! Keep your rambles coming! Nice to see your blog keeps going , lets hope you get some rain , so as not to run the generator ! Hope to catch you soon..